The Beginning: To start with, my journey as a blogger began owing to my interest in beauty posts and the aspect that inspired me the most to ardently take it up was the lack of sufficient material on the topics which I wanted to read about. So to be honest I feel I did a shoddy at blogging for the first few months but soon I began enjoying writing blogs and as my liking grew I tried to dig deeper to understand various subjects that I wouldn't have otherwise. Some of my friends and family were of the opinion that beauty blogging was all about buying makeup and using it; and I wouldn't lie, several of them are still quite ignorant about how blogging works in reality. They fail to understand that beauty Blogging isn't just about buying makeup and using it; rather it is more about being a good photographer, editor, promoter, developer, search engine optimizer and definitely a vigilant consumer. Rebranding Journey: As time went by I got more serious about the work I did and that was when I decided to rebrand my blog; most importantly get a customised domain name. My blog had definitely outgrown Chic Peachy Pink as it no longer was just a makeup and beauty blog but had a hint of technology, lifestyle and fashion choices added to it. After countless brainstorming sessions with my friends The Chicster Diaries was created, A place for every makeup, beauty loving, tech savvy, fashionista who doesn't have to choose between being chic or hipster. The major highlight of this year had definitely been the domain name change from Chic Peachy Pink to The Chicster Diaries. I had been reading about it for quite a while and was a bit skeptic as I was aware that there are chances that I may loose some readers owing to the name change. However, it has only been a few months since my blog got renamed and I have gained more than double the readers during this time. So, my suggestion to all the bloggers out there who are reading this is: Trust your readers and go ahead and get a custom domain name! Hope you liked this post and do share in the comments section below your Tales of 2015? 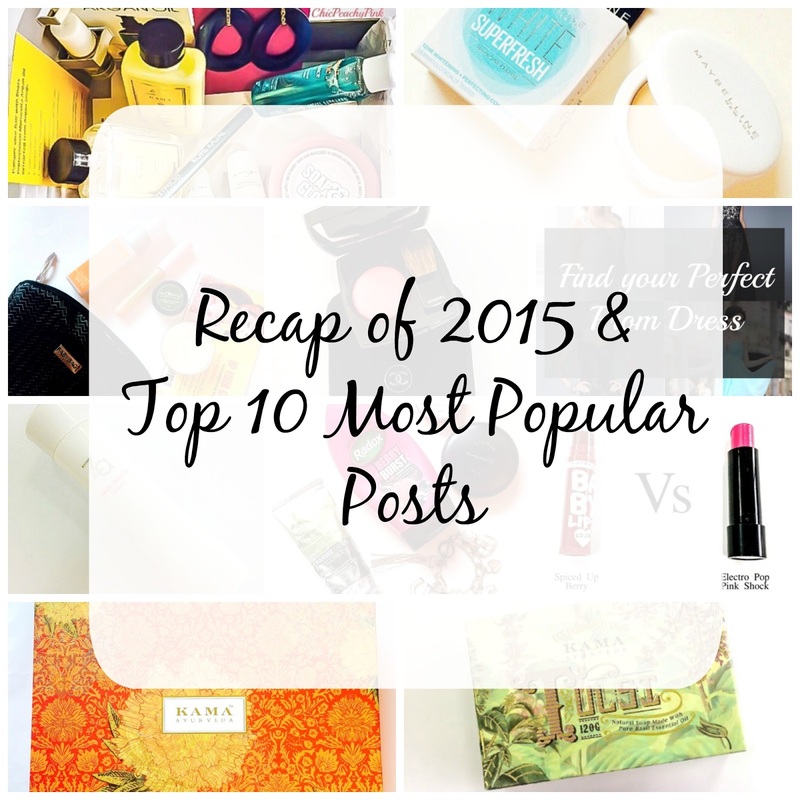 Also which was your favourite post from the list of my top 10 most popular posts? What a great read it was! Reading success stories form other bloggers really inspires me. I wish you lot more success in 2016. My story as a blogger is short and simple! I am a newbie into this business and just completed 4 months. 2015 was special as I have finally started out my own blog (after reading other beauty blogs for more than 5 years, can you believe? ), my blog got appreciated by other bloggers and I have made some real good friends out of my fellow bloggers! 2015 ended wth a good note and I am hoping for a better 2016!! Congratulations. Your posts show that you are a talented blogger. Wish you more success in 2016. Congratulations, you're a successful blogger and that's inspiring. All the best for 2016, and I hope it will be even better. What a cool year you had- especially spearheading that re-brand. Those are tough to do- well done, lady! Happy 2016! Your last year was fantastic!! Hope tgat this one goes more better than before. I love to read all my ur post and your maybelline lup balm one is my favorite. The special ibdian lip care!!! Lovely Post! Wish you much more success in 2016! I wish you to achieve even more in 2016!